A tricky tie, a lengthy journey and feisty opponents. But Yemi Odubade’s second-half winner saw Eastbourne Borough safely through the first stage of this season’s Emirates FA Cup campaign on Saturday, with a 1-0 win at Brantham Athletic. The Suffolk hosts, from the Eastern Counties League, bridged a nominal three-division gap in status with an exuberant conquer-or-perish performance which tested the Sports to the limit. Well it wasn’t the once, but it came quite close to the twice. Jamie’s assessment is totally right, but – however often we say it – status counts for very little in the FA Cup. The Step Five opponents played out of their skins and they came within touching distance of an upset. The Sports had to be as focused and disciplined as against any National South opponents. They came by car and coach, they came by train and cycle. No, not actually bicycle, although one of the Railway Warriors ruefully posted on Facebook that he'd taken four cabs, eight trains and two bus replacements to get to Brantham and back.... Anyway, as always, the Sports were proudly and vocally represented. For the good people of Brantham, this was more than a football match. The village, squidged between Colchester and Ipswich, is actually on the London commuter route thanks to a handy local rail station, but it is no London-on-Sea. Nestling in Constable country – just a mile from Flatford Mill, in fact – the pace of life seems relaxed and genial, and the welcoming voices of the car-park stewards had a little twang of East Anglia. From the chairman-to-chairman lunchtime phone call, guiding the Borough coach to the ground, to the warm departing handshakes, the hosts could not have been more hospitable. 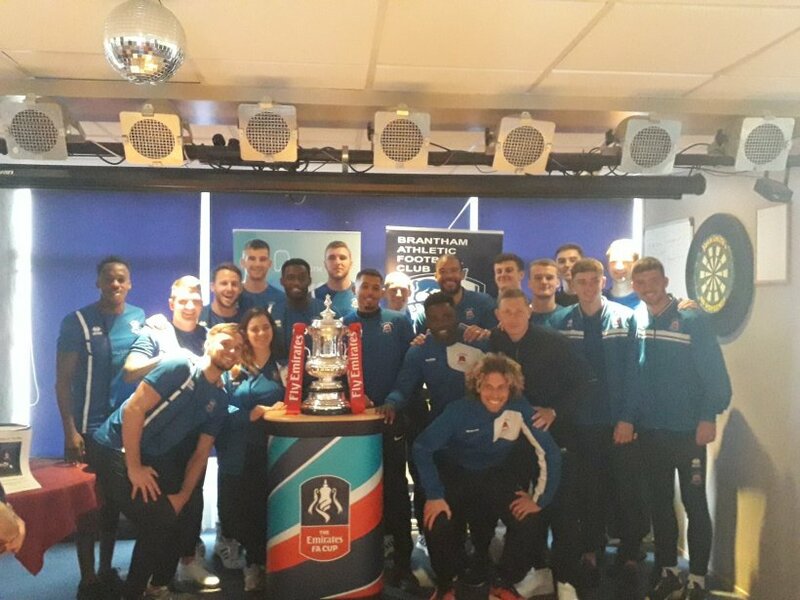 The clubhouse was heaving and noisy, there were raffles and improvised burger stands, and the FA Cup itself stood gleamingly centre stage for everyone’s souvenir photos. History was all around, with a drop-in by Allan Hunter and Bryan Hamilton, members of Ipswich Town's 1978 Cup-winning squad under Bobby Robson. And poignantly, we were scheduled for a minute's applause at kick-off for Ipswich and England legend Kevin Beattie, who lived in the village and sadly died last week. As three o'clock inched nearer, the excitement was tangible. The Iittle imps of the Imps’ junior teams formed a guard of honour as the teams took the field, and the stage was set. So much for the mood music, now for the main event. Well, if Borough played all the tunes, it was often Brantham who beat the drum. They were direct and uncomplicated and they never let their higher-ranked opponents relax. While the match remained scoreless – for almost an hour – everyone knew that one sucker punch could send the Sports tumbling towards the exit door. On a reasonable playing surface with the odd bump and a slight slope, Borough did start with a flourish. Ryan Hall created his own space for a fierce shot, bravely stopped by home keeper Luke Avenell, and a Kane Wills drive was deflected for a corner. Dean Cox looped a shot too high, and then Avenell wonderfully defied Charlie Walker, pushing the striker’s explosive cross-shot past the far post. So, incredibly, it might have been 4-0 after barely fifteen minutes. Or actually, 4-1. Breaking out suddenly mid-way through that siege, Sam Newsom’s pass found Michael Brothers advancing from the right and steaming through a wide-open Borough half. Trying his luck from fully thirty yards, the Imps player-manager struck a sweet dipping volley destined for the far corner – until Mark Smith, arching and stretching, brilliantly turned it past the post with his right hand. For all his muscled frame, Smudge has the athleticism of a gymnast, and that was possibly his finest save since joining the club last autumn. The Brothers effort was to be one of only two really clear chances for the home side. The other came on 38 minutes, when striker George Clarke rode two rather hasty challenges and pushed on into the box. But with Eastbourne bodies in his wake and with plenty of goal to shoot at, Clarke scythed his shot just wide of the right-hand post. Otherwise, the Sports still dominated. With Marvin ruled out by an Achilles problem, Sergio unusually slotted into the full-back berth – and at the midfield hub of the team, Ryan Hall stepped up with his most impressive game yet in a Borough shirt, probing and tackling alongside the ever-dominant Wills. Cox, often combining well with Kristian Campbell, found space and angles on the left, and a stylish Mike West offered contrast on the right. All they needed, then, was a goal. Lloyd Dawes, easing back from injury, was lively and striker partner Walker was livelier, but the home defenders were covering all bases. In fact as half-time approached it was centre-back Tom Gardiner who came closest, heading over from Cox’s cross after a Borough free-kick. An intriguing forty-five minutes then, and all outcomes still open. Referee Rob Whitton was enjoying an afternoon free of controversy and free of yellow cards. The game flowed, and the fouls count only just just crept into double figures, with an occasional robust challenge but never any malice. The Sports did have one strong penalty claim, just after half-time: Campbell, sent clear by a sublime Hall pass through the channel, was felled on his skeltering run for goal, but that was as close to controversy as we came. Borough quickly picked up the action, Walker’s shot on the turn drawing a fine save from Avenell, and then on 53 minutes Howell introduced Odubade for Dawes. Within three minutes came the breakthrough. Avenell punched away a right-wing corner, but Hall popped the ball straight back into the mix, and as Gardiner nodded it goalwards, Yemi pounced for a close-range finish. Now, where would this absorbing contest go next? Assured game management by the Sports, and exhaustion and deflation for the Imps? Correct on the first count, mistaken on the second. Without a hint of surrender, Brantham raised their game, raised their tempo and raised the hopes of their supporters. It was time to consolidate around the excellent centre-back pair of Gardiner and Ransom, the Mr Steady and Mr Sturdy of this new Borough outfit. Howell also introduced Tom Day and, in the final few minutes, Ian Simpemba to shore things up, but the home side still flung themselves at Borough. Young substitute Mason Ridgeway-Lumley – at 19, his age duplicated by his shirt number – made an instant impact with scorching runs down the right, and with ten minutes left, Clarke saw his close-range equaliser heart-stoppingly ruled out for offside. Into added time, Borough contrived to concede three free-kicks, but Brantham failed to find any chinks in the armour. Truly classic FA Cup ties are supposed to include a shock upset. The Sports will happily settle for a decent game, a routine victory and a £9,000 boost to the bank balance. Borough: Smith, West (Day 67), Campbell, Wills, Ransom, Gardiner, Cox, Torres, Walker (Simpemba 85), Dawes (Odubade 54), Hall. Unused subs: Martin, Bridges, Pollard, Shaw.